The Centenary Sprint Cup, originally known as the Centenary Cup, was first run on November 24, 1984 to celebrate the Hong Kong Jockey Club’s centenary. It was the second leg of the inaugural Champion Sprint Series in the 1993/94 season, and was held as a HKG2 event. This race was upgraded to HKG1 status in the 2000/01 season and has been programmed as the first leg of the Champion Sprint Series, and currently the Hong Kong Speed Series, since the 2005/06 season. 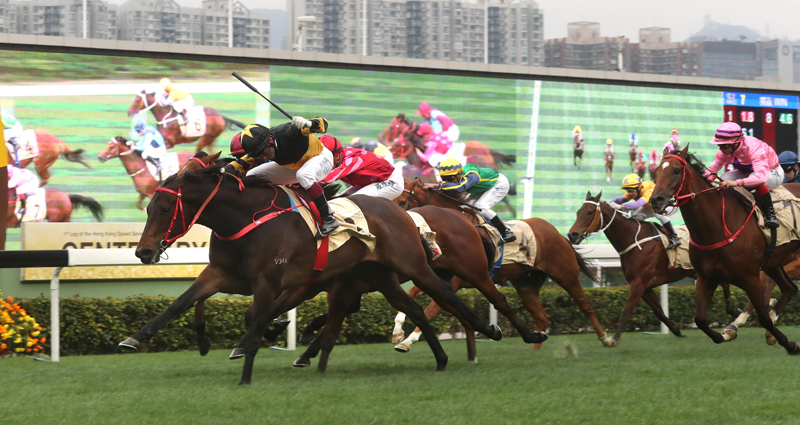 The race distance changed from 1000m to 1200m, and the prize money increased to HK$8 million, during the 2015/16 season. The race was upgraded to international Group 2 status in 2017, before attaining international Group 1 status last year, with prize money further increased to HK$10 million. Champion sprinters including Silent Witness, Sacred Kingdom and Aerovelocity are among the names on this elite speed contest’s honour roll, as well as D B Pin, the winner of this race last year. Trained by John Size and ridden by Olivier Doleuze, D B Pin (No. 2) wins the 2018 Centenary Sprint Cup at Sha Tin Racecourse.